Georgia State students no longer have five presidential candidates to choose from, only two: Jazmin Mejia and Anthony Jones. After weeks of tabling and talking to students in Library Plaza, hanging posters in the halls of Student Center East and trying to prove their worth, both candidates will be headed to a runoff. This second election was triggered because none of the candidates in this year’s Student Government Association election received 51 percent of the vote, nor did the top candidate receive 15 percent more of the vote than their runner up. 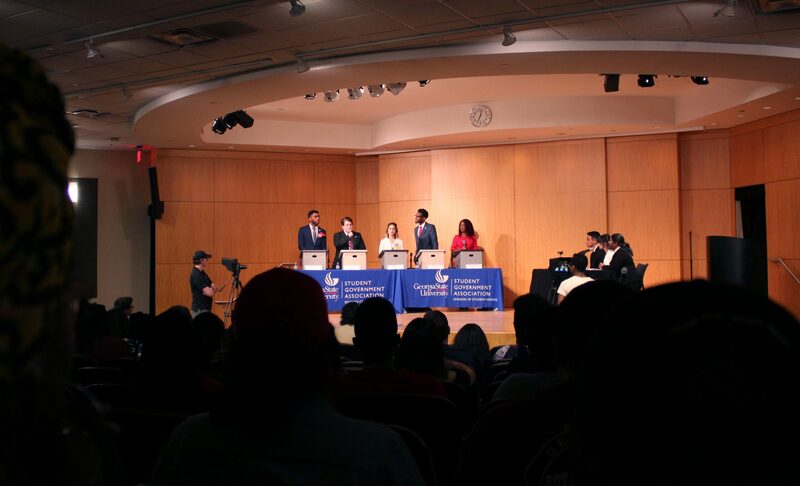 The two candidates will face the student body’s discretion again, but for one day only –– Thursday, April 4. Students can vote at pin.gsu.edu. Running on the platform of A.C.H.I.E.V.E. –– adapt, challenge, heights, innovate, engage, variety and effort –– Jones is involved in Panther Ambassadors, the 1913 society and the Pi Alpha Chapter of Phi Beta Sigma Fraternity as the director of fundraising. Jones has prior SGA experience but was removed from office last semester for missing too many meetings and subsequently receiving too many points. One point emphasized in his platform is the creation of a Pounce Convocation Walk, in which each freshman would touch Pounce’s nose in Unity Plaza on the way to their convocation ceremony. Because he violated the election code, Jones now has a sanction for a 72-hour period – and a seperate sanction for a 48-hour period which will take place concurrently. During this period he will be unable to campaign for three days after a meeting with the Election Commission on Monday. Consequently, he will only be able to campaign for a portion of the voting day. Mejia, daytime chair for Spotlight Programs Board and alumni networking chair for the Phi Alpha Delta Law Fraternity, has gained experience as an SGA senator during this year’s administration. Her platform focuses on boosting financial literacy and holding the Office of Financial Aid accountable, as well as increasing collaboration between Georgia State’s many student organizations to provide better communities for students. But the student body won’t only be voting for president in the upcoming runoff election –– two candidates for executive vice president will also be heading to a runoff. Hamza Rahman and Jesse Calixte both will have a chance to land the EVP position on the Atlanta campus; the winner will work closely alongside the next SGA university-wide president. The Signal will deliver the results of the runoff election on Twitter on Monday, April 9. As previously outlined in the last issue of The Signal, Sen. Kaelen Thomas will be the next speaker of the Atlanta senate after his opponent was disqualified for missing the SGA debates. The full results of the election are available below, which includes senators and some vacancies. The application for these seats can be found on pin.gsu.edu and opens April 1 until all positions are filled, with priority review beginning April 11. The role of Communications Director, Finance Director and the Atlanta campus and University-wide Senate Clerks will be decided following the application period of April 1 through April 10, also available on pin.gsu.edu. More students voted in this year’s election than last; turnout jumped from 1,475 to 2,526 total votes. Across all campuses, 5.75 percent of all eligible student voters participated in this year’s election. The College of Arts and Sciences and the Robinson College of Business were the two colleges with the highest voter turnout, with 7.61 and 7.06 percent of their enrolled students, respectively. Of the Perimeter campuses, Clarkston had the highest voter turnout at 8.26 percent – higher than any individual Atlanta campus college. The College of Education & Human Development, School of Public Health and Dunwoody and Alpharetta campuses all saw less than 5 percent turnout; Dunwoody saw just 2.04 percent turnout.